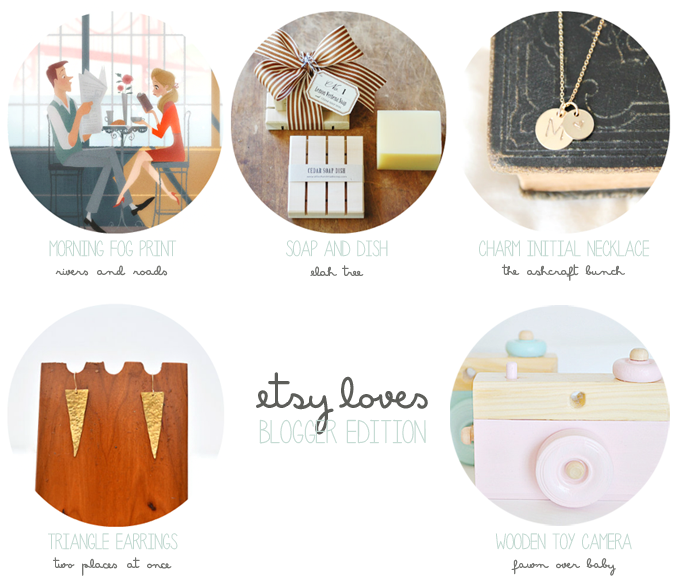 With today's installment of Etsy finds, I thought I would change it up a bit and showcase some of my blogger friends' loves! There are so many amazing artists out there and Etsy is the perfect place to find them all under "one roof". You're sure to find handmade, one-of-a-kind gifts your friends and family will love as well as special things for yourself. Sometimes I find myself on there for hours just ooooogling over all the amazing finds! "As most people know, I am obsessed with all things Disney and everything animated. Samantha from Elah Tree actually just introduced me to Brittney Lee, who is a concept artist for Disney! Ahhhhhh! As in, she has worked on Frozen and Tangled and many, many other projects. I have been drooling over her blog and her etsy shop over the past week. This would be my dream job if I had the moolah to go back to art school! Until then, I'll just be stalking Brittney's blog and watching lots of Disney movies. :) I love this dreamy coffee shop print. It just looks like the perfect morning!" "Etsy is one of my favorite places to find unique gifts, items and inspiration. There is always something amazing to find. Recently, I've been loving all the soaps and soap dishes, not sure why, it's probably because I think they are pretty. I have been swooning over a homemade soap and ceder soap dish I found. I just think it's lovely." "I am loving my new necklace from Mia Earrings! :)"
"I've been loving the jewelry you can find on Etsy. It's high quality and so unique! One of the shops I love is Moulton, based here in Austin. She designed the earrings for my bridesmaids and they were beautiful!" "Sheesh, where do I start? I'm smitten over so many etsy shops lately. Since the day my little one came into the world, it seems as though my camera was attached to my face. Now as she has moved into toddler-hood, she has become more interested in how the camera works and looking at photos of herself after each snap of the shutter. What better way to help bring out the mini photographer in her, than to present her with her very own mini camera! These little cuties are handcrafted out of pine wood, painted with simple and soft colors and the perfect size and shape for my toddler's little grip. Now she can have her own little photo sessions and embrace her imaginative/creative side." What are some Etsy finds you're loving right now? If you haven't heard, right now if you use code SUMMALOVING upon purchasing an ad spot, you will receive 20% off! Hurry! This discount is good only through the end of the month! Oh I love this!! Etsy is the bestest! So many fun goodies! Oh my! Britney Lee is so amazing! Tyler and I have that print! Oh awesome! I'll keep em coming then!